Witches and wizards have a unique code when it comes to what's cool. While modern kids are flaunting the newest technical toy, magical kids impress each other by finding the oldest, most elusive potion ingredients. Last week, in Dakota County School for Country Magic, there was a particularly good rivalry. It started when Erma brought her great-grandmother's bundle of fiddle leaf tea to potions class. It made an impressive purple brew that made the tree outside grow ten feet when it was thrown out onto the yard. The contest was on. Henry brought an egg laid by his pet tortoise fifty years back. Flossy brought antique wig powder from the 17th century. Then Diane snuck in a tin of mummy wrappings dug up by her archeologist uncle. The eerie, haunted potion that brewed from her offering is what stopped the whole ordeal. Even the most laid-back teacher isn't cool when a student brings a mummy curse down on the classroom. 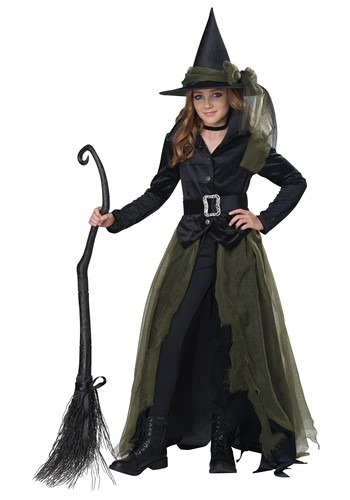 Now, your child might not have access to ancient ingredients but she'll definitely look like the cool new witch in town when she's rocking this wild look! Your little witch will look like a boss when she appears in these digs. This costume features a velvet-textured jacket with silver-colored buttons. It's layered under a thick belt and paired with a raggedy overskirt that can be layered over any pair of leggings. It has two layers, one is a flat black with a raggedy hemline and the other is a lightweight gauze to make your child's silhouette extra dramatic as she walks around on Halloween night. This witch will easily pair up with a whole crew of gals on this season. A coven motif would be a super fun theme for a party in the Halloween season. Lucky for your witch and her friends, we have sizes and styles for everyone. That's pretty charming if you ask us! Medium Skirt Length 35" 35"
Large Skirt Length 35" 35"
X-Large Skirt Length 35" 35"